Article from the China Labour Bulletin on the development of class conflict in China in the post-Mao era with particular focus on the spring 2002 protests. In the spring of 2002, workers who had dedicated most of their working lives to the industrial construction of socialist China set off the most significant episode in the recent history of the Chinese labour movement. Over 80,000 workers in northeastern China organized a sustained struggle to defend their livelihoods and rights. Fifty thousand oilfield workers from Daqing and another 30,000 workers from the metal and other industries in Liaoyang launched street protests, road blockades, pickets, sit-ins and negotiations for over three months, beginning in March 2002. This latest initiative marks the third wave of the independent labour movement in the post-Mao era. The independent labour movement first took off amidst the drama of the popular pro-democracy urban movement in the spring of 1989. The numerous Workers' Autonomous Federations (WAFs) formed by workers and students in cities across China at the height of the mass street demonstrations in May and June, 1989 signified the first ever nationwide attempt by workers to organize an independent body to articulate their political and social aspirations. Although the WAFs were by and large set up as supporting bodies to the student-led pro-democracy movement, they represented the first public political platform built upon a clear working class constituency which declared a departure from the line sanctioned by the Communist Party of China (CPC). In the subsequent government repression of the 1989 pro-democracy movement, the workers' leaders were targets of particularly harsh punishment, illustrating the party-state's fear of the political potency of an independent and defiant labour movement. In the wake of the relentless repression by the government of any autonomous civil organization, several initiatives to advocate labour rights were organized in the first half of the 1990s. Between 1990 and 1994, several clandestine organizations were founded which in many ways furthered the call of the 1989 WAF movement to re-establish the political rights and socio-economic status of the workers. This second wave of the independent labour movement was represented by the Free Trade Unions of China in Beijing (1991), the League for the Protection of the Rights of Working Peoples in Beijing (1994) and the Hired-Hands Workers' Federation in Shenzhen (1994). Although these initiatives suffered from extremely short life-spans before organizers and leaders were imprisoned, they represented pioneering political efforts to chart new courses. There have been several attempts by workers and cadres to establish more autonomous labour unions in the 1950s, 1960s, and 1980s. But none of these attempted to organize a trade union body which specifically aimed to protect the rights of the working people while remaining openly independent of the party-state. The second wave of independent labour organizing differs from the 1989 WAF movement in its attempt to organize around class-specific objectives with a class-specific constituency. The primary goal of the WAF movement was to strive for political reform of the government system, echoing and supporting the students' calls, a political agenda which was not reserved specifically for the working class. Mass labour protests in post-Mao China can be separated into economically-driven protests and political rebellions. Despite their intent, these first two waves of labour organizing failed to recruit mass membership from among rank-and-file workers. The independent labour groups in the 1990s failed to base their membership or organization in factories or workplaces, mainly due to the uncompromising ban of such kind of organization by the government. Most of their leaders were members of the intelligentsia. Furthermore, the agenda of these pioneers was largely political (except for the HWF) and not workplace-specific. Hence the first two waves can be categorized as politically-driven labour rebellions. As many observers have noted, these initial waves of labour organizing were characterized by spontaneity, fragmentation and transiency. The 2002 outbreak of workers protests marks a watershed. They are distinct from the previous decade of labour organizing in their advocacy, constituency, actors, and modus operandi. Hence they represent the third wave of labour organizing in post-Mao era, not only because of the time period between them and the previous initiatives, but also due to their nature and characteristics. The mass workers' protests which took place in the Spring of 2002 were all economically driven and the organizing was workplace-based. In many ways they also signify a step forward in the development of a labour movement because they involved stronger membership, unity, leadership, and a better level of organization. While delegates and government leaders talked about the dire straits of the retrenched and retired workers and the threat of social instability, nearly 100,000 workers in the northern and western provinces of Heilongjiang, Liaoning, Sichuan, and Hebei mounted street demonstrations and traffic blockades calling on the government to deliver provisions for basic subsistence for retrenched and retired workers. They also called for the removal of corrupt and incompetent local officials. Recent public pledges by party-state leaders to care for and improve the situation of marginalized workers have not translated into concrete acts of support for workers drawing attention to their problems. On the contrary, police moved in to detain the leaders and organizers, and para-military troops were mobilized to stop the workers' actions. Yet despite the government crackdown, the protest actions in Daqing and Liaoyang continued for over three months. These initiatives marked a departure from the pattern of isolation and spontaneity which characterized previous workers' protests in the 1990s. The Daqing protests were spectacular not only because they vividly symbolized one of the starkest contradictions in communist China but also because, for the first time in recent history, an independent union was formed by a large number of workers from the same workplace. At the height of the protests in early March, the workers took over the headquarters of Daqing Petroleum Administration Bureau (DPAB) for over a week. In front of the DPAB building is the famous Iron Man (Tieren) Square, containing a statue of an idealised worker: the iron man of China. The iron man was Wang Jingxi, a model worker from the principal model industrial facility in China which formed the centrepiece of national propaganda about communist-led industrial achievement in Mao?s time. There cannot be a more contradictory sight than 50,000 Daqing oilfield workers demonstrating against the loss of their livelihoods right under the nose of the statute of China's most exemplary worker. Many people in China, most of all the oilfield workers themselves, see the Daqing oilfield workers as the best example of selfless contribution to the industrial construction of the nation. Retrenchment is not something they feel these workers deserve. The potency of the Daqing demonstrations has not stayed within the borders or Daqing nor even Heilongjiang province. Despite attempts at a total news blackout, oilfield workers in other provinces learned about the protests and staged solidarity strikes and made similar protests against the threat of retrenchment. This again marked a significant watershed as, for the first time since 1989, labour organizing succeeded in breaking the party-state's attempt to prevent any horizontal linkages between social actions. The bonds between workers from different enterprises, localities and industries was forged in their struggle for a common goal -- to defend their livelihoods and their right to work. This platform will only gather momentum in the coming years as the number of workers who are threatened with unemployment and loss of pensions continues to grow sharply as a result of intensifying economic liberalization and the affects of globalization. The Liaoyang protest staged by the Ferroalloy Factory workers turned out to be another significant landmark in recent labour organizing. 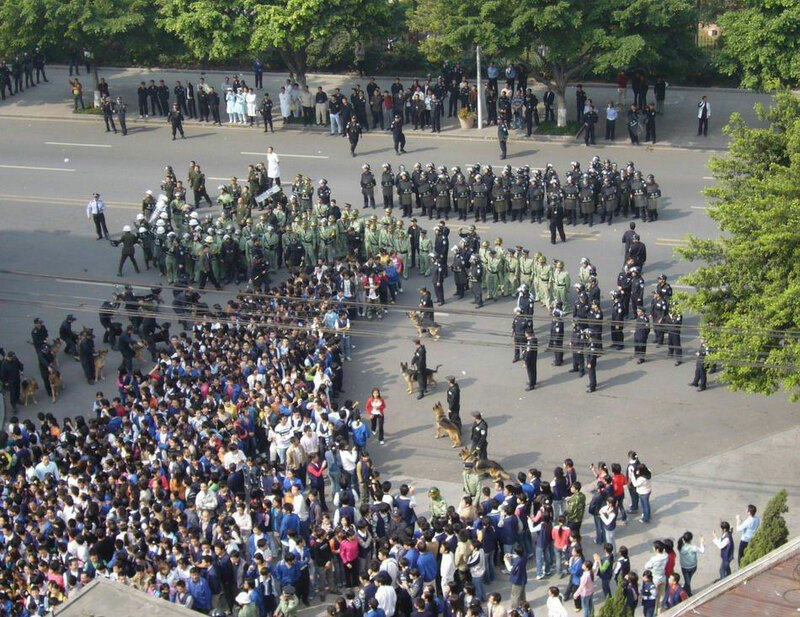 Although much smaller than the Daqing protests at the outset (there were several thousand workers who began the demonstration at the Liaoyang city government in early March), the level of organization, unity and tenacity shown by the protesters has apparently grown stronger in the face of police crackdowns. An otherwise easily-diffused small-scale protest has developed into a highly-organized and sustained labour struggle. Police brutality against the demonstrations and the detention of several representatives one week after the first protest action was staged brought 30,000 workers from over a dozen factories out in the streets of Liaoyang to express their support and solidarity for the Ferroalloy workers. The Ferroalloy workers continued for several months to organize regular demonstrations demanding the government release their representatives and respond to their calls for investigation into corruption in their enterprise and in the local government. The main strength of the Liaoyang protests lies in their high level of organization which unites the plant's workers around an open leadership. In this sense the Liaoyang Ferroalloy Factory workers have organized the most successful archetype of an independent union in China since 1949. The key issues arising from the Spring 2002 workers demonstrations are primarily economic. This is also the case of tens of thousands of workers' protests which have taken place in China since the mid-1990s. These workers, most of whom are in their forties and fifties having devoted their entire working lives to the state-owned enterprises, are the principal losers in the deepening economic reform involving privatization and liberalization. As the party-state intensifies its re-structuring of the country's state-owned enterprises with closures, merges and privatization, millions of workers in the state sector have been confronted with the new reality of mass lay-offs, long-standing wage and pension arrears and loss of basic social security. Suffering from a steady and visible decline of socio-economic status, such workers have been waiting for nearly two decades for the promised benefits of reform through 'market socialism.' Many are beginning to realize that the reformers have no plans for them. Among the banners of the protesters, some read:We don't want to be tricked again! and many shouted Give me my job back! [In our factory alone] there are over 5,000 employees - which means 20,000 people don't know where the next meal is coming from. So many of us are living on the breadline. What kind of future do we have? Our children won't have any work. I have two kids myself who aren't working. Another worker from Liaoyang explains why her fellow workers are willing to protest despite the risk of police detention. The Ferroalloy Factory workers are on the edge of destitution. In another year we will have to go to the government begging for food with our empty rice bowls. We are not afraid anymore, we just want our representatives to be released and this business at the Ferroalloy Factory sorted out properly. We have already stuck our neck out; we can't be worried what will happen to us anymore. We have to get rid of this corruption! I am 57 and a communist party member. I joined back in '65 because I believed the party's aim was to secure the welfare of the people. What I see now is that they are not providing welfare to the people, so we ordinary people have to rely on ourselves to protect our right to a livelihood. The key activists and organizers of the Daqing and Liaoyang demonstrations are rank-and-file production workers from the rust-belt industries of petrochemicals, metals, mining, transport and textiles. The majority of them are 40 to 50-year-old men. Among the four detained leaders of the Liaoyang Ferroalloy Factory protesters, three are in their fifties. Many of the key leaders of the Liaoyang demonstrations appear to have been involved in labour actions for some years. For example, Yao Fuxin (54), a former worker of the Liaoyang Steel Rolling Mill, has become a key leader of the Liaoyang Ferroalloy plant struggle since 1998. We will continue tomorrow, but again, it will be the old folks taking the lead. The young people all want to come out. But, the older ones want to protect them and they won?t let them out. Among the 50,000 protesting workers from Daqing oilfield, many come from higher than average education and skill levels. They are all workers. About 40 or 50 years old. The people demonstrating are all different types. There are engineers, basic-level cadres, technicians, technical assistants and teachers. More than 40 teachers from the Daqing PAB's Vocational Teachers college; 2,000 plus from the middle and primary schools - all these people have been retrenched. As well as a few hundred teachers from Daqing's Technical College. These people are the backbone of the industry and very highly educated. Some of the teachers are still very young. Maybe four or five people. They all seemed pretty clued up and well educated. Able to write well and speak articulately and they understood the law as well. We are barely eating enough, while the officials and managers are very comfortably off. For the past year they have been carrying out this reduce staff and increase efficiency policy while at the same time [giving themselves] hundreds of thousands of yuan in bonuses. It's corruption that allows them to live in 200 plus square metre though they don't do anything for ordinary people. Take the chief of police and top cadres like him. They live in special houses. Daqing now has a squad of 800 People's Armed Police (PAP) to guard the leaders' housing compounds round-the-clock. These people are scared to sleep at night. [quoteRight now, we have got to get this all-pervading corruption sorted out. The factories are being ruined by these corrupt officials. The bosses and the city leaders are in it together and are ruining our industry pure and simple. Virtually every citizen in China, when asked, would have endless stories to tell of how corrupt party and government officials are. A common saying goes, the higher up their rank is, the more corrupt they are. Well of course they can't, but they will still try! There is no way they can really meet the demands of the workers. Their corruption and embezzlement has led to debts too great to cancel out. They can?t arrest all the workers. The people who have demonstrated are on the edge of existence with nothing to loose. There?re too many for them to arrest all. These people haven?t committed crimes. We are simply asking for our wages so we can carry on living ? what?s wrong with that? I want to live and eat. I don?t want to eat fancy food, just enough to get by. Right now, there are so many laid off workers in Liaoyang with no dole and no wages. We are all being squeezed tight. Think about it, if you're 30 to 40 years old and they pay you off with a few thousand bucks ? how long is that cash going to last for? Of course they are! The city leaders are in the wrong. If they weren?t, then the workers wouldn?t be demonstrating. They don?t have enough to live on. Living standards should generally improve. But theirs are not. Such widespread and deep rooted embitterment towards the leadership of the party-state makes most of the economic agitation waged by workers in present-day China intrinsically political protest. It is this unavoidable political aspect of labour unrest which has led the government to relentlessly repress labour protests. Organizers are often incarcerated for the crime of subversion, although the protesters are primarily expressing economic demands. The Third Wave of independent labour organizing has repeated many methods of organizing similar to the predecessors in 1989. The prime arena is the streets and principle actions are still public demonstrations. But the 2002 Daqing and Liaoyang protesters are different in that they have organized activities centering around their workplaces and residential communities. This crucial factor explains the ability of the protesters to sustain their actions in spite of government crackdowns. Another significant difference in their modus operandi is that the 2002 protests address their demands to their enterprise leaders and to the local government. Although the protesters in both Daqing and Liaoyang have also tried to present their petitions to the central government in Beijing, their demands remains focussed on local issues and specific grievances. In this aspect there is a difference between the Daqing and Liaoyang demonstrations. While Liaoyang Ferroalloy began their protests at the city government and demanded a government response, the Daqing oilfield workers have from the beginning focussed their demonstrations on their enterprise, the Daqing Petroleum Administration Bureau, and demanded talks with the top management of the enterprise. This may explain why government repression is more severe in Liaoyang than Daqing. Four leaders of the Liaoyang action were detained by the local police at a very early stage. While there has been speculation about the disappearance of several dozen Daqing protest organizers and leaders of the provisional labour union, there have not yet been open arrests by the government. The most critical breakthrough made in the 2002 demonstrations is the formation of a prototype independent union body, the Daqing Provisional Union of Retrenched Workers. Unlike the FTUC and the HWF formed in 1992, the Daqing union membership is plant-based and has a clear target membership and constituent base. There have been reports that preparation for this independent union body had been taking place quite some time before the March actions, indicating that the action was not spontaneous. Similarly, a group of 10 representatives of Liaoyang?s Ferroalloy Factory went to Beijing to petition for a clampdown on corruption in 1998. During the following year, Liaoyang workers repeatedly tried to bring claims of corruption against their enterprises and local government leaders to the attention of the central government, the CPC Disciplinary Committee, the State Council's General Office, and even the All-china federation of Trade Unions (ACFTU). However, their petitioning efforts were all unheeded and the workers turned to street demonstrations. On 5 March, the government told us to select ten representatives [to negotiate] but they were detained after they entered the building and didn't come out again. They were taken away and locked up. After they were detained, a former work unit leader was taken back to his house and had to write a pledge not to leave his home. If he did, he would be detained. He even had to mark the pledge with a thumbprint. Interviewer: So that's why no representatives have been elected since this incident? Worker from Daqing: That's right. Who's going to risk it when they have already detained ten people. Interviewer: In the first few days of the demonstrations we heard that some people were putting up bills and posters in the name of the Standing Committee of the Retrenched Workers Provisional Trade Union? Worker: Yes. They were putting them up on the DPAB's walls south west of the main gate. These people have also been detained. They are not around anymore. Anyone who writes or puts up posters and stickers, slogans or hangs banners has been taken away. These provisional trade union people were doing the ground work by putting up posters and bills [in the trade union's name]. The posters that have gone up since are not signed by the provisional trade union or anyone else. They just have the date at the bottom. The Liaoyang demonstrators decided to put forward only old people as their representatives, hoping to avoid confrontation with the police. Since they arrested four representatives, the others cannot come out now. They said whoever came out would be arrested. Today there was only one representative. He is a paralysed patient and was pushed to the scene in a wheelchair by some old folks. He is an old worker of the Ferrous-Alloy Factory but he is paralysed. Two old ladies pushed him to the site, he was the only representative today. They all wanted to go and demonstrate. But once I got down there and talked to them they got the message. Right now everyone is waiting for news [of the representatives]. If they release them within a few days then we won't prepare for any further action. We are just waiting to see how things develop. If they don't release people, then we'll have to have a rethink; but if they do release people, then we'll leave it at that. For the moment, we will wait and see. Overall, the modus operandi of the Daqing and Liaoyang protests reveals a more mature level of organization than any seen previously in post-Mao China. This will probably contribute to future initiatives by workers seeking to organize an independent labour movement. The 2002 spring protests are still a far cry from mass strikes waged by hundreds of thousands of dock and railway workers in Canton, Shanghai and Beijing in the 1920s and 1930s, which delivered the first Chinese labour movement. But these early labour struggles of the 20th century were primarily nationalist struggles. The 21st century labour movement takes shape as a defensive and class-specific struggle. In their struggle for the rights to defend their work and livelihoods in the face of privatization and globalization, the Chinese labour movement has at last found common ground with the democratic labour movements around the world. Closer to home, the 2002 demonstrations carry with them far reaching significance for the independent union movement. The critical barrier to horizontal linkages and solidarity actions has been broken. A firmer foundation of leadership and organization has been laid. Government repression might forestall the movement for a few more years. But if the structural problems are not solved, labour protests look set to grow at a faster rate and with greater strength than in previous years. As the events surrounding the latest wave of labour organizing are still unfolding, the background, government responses and impact of the episode will require further examination in a future article. RFA, Radio Free Asia broadcast. All the interview quotations used in this article are from the programs—China Labour Bulletin and Labour Express—hosted by Han Dong-fang and broadcast on RFA between March and May 2002.